June and July are really dull months in the NFL, unless you delight in seeing yet another Detroit Lion get charged with a DUI. Rosters are set, but training camp is yet to open up, and outside of the tense negotiations over contract disputes there is little going on that is open to the public. So after seeing ESPN and other sites begin to push their fantasy football leagues, I figured it would be fun and interesting for me to put out some top 10's of QB, RB, WR and TE for the upcoming fantasy season. These are obviously just my rankings, and are likely to change many times before September comes round. The top 3 can hardly be surprising. 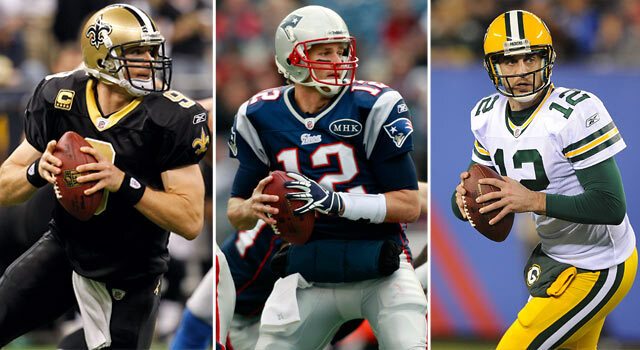 Rodgers, Brady and Brees are the best players in the league and the true elite QB's in the league. You might be a little surprised that I put Brady above Brees, after all Brees was 2nd in scoring (Standard ESPN league) in 2011, 5pts behind Aaron Rodgers and 28 ahead of Brady. Well lets just call this the Bountygate drop. The lack of Sean Payton throughout the 2012 season could be very damaging to the overall game planning as well as heaping pressure on Brees' shoulders. He's also lost Robert Meachem while Tom Brady has gained Josh McDaniels and Brandon Lloyd this off-season. Behind the Big 3 you might be surprised to see Cam Newton (3rd = QB in 2011 with Brady) drop to 5th here. This is because a huge chunk of Newton's points (154) came from his 700yds & 14 TD's on the ground. Those are very unlikely to be repeatable. And even if they transfer to his passing stats that's still a big hit as it's 2 less points (again, in standard ESPN leagues) for a passing TD than it is a rushing one. Stafford gets the nod at #4 thanks to Detroit's love of airing the football, as well a draft that handed him a good blocker and an underneath threat. After that, it's really the same old names. Eli Manning, Phil Rivers and Tony Romo are all waiting for that break-out fantasy season to push them up from the pile of good fantasy choices into the higher echelons of elite players. After that it comes down to personal preference and injury risk. Big Ben takes more shots than a boxing gyms heavy bag and always seems to get hurt, Matt Schaub is a fairly average player, as are Matt Ryan, Joe Flacco and a like. You'll also have noticed that Peyton Manning is absent. This is because I'm really skeptical about his health and ability to gel with his new team mates. Can Thomas and Decker get open consistently when teams are actually focusing on them rather than the run game? Who knows, it's just too risky for me to pick him above even an average fantasy option. As for Michael Vick? Feel free to risk it, but I'm not touching the guy. This is another case of balancing risk & reward. The risk of Adrian Peterson's ACL, Darren McFadden's general glass nature and Fred Jackson's battle for touches are not enough to quite put me off of their high upside. Where as Matt Forte's knee (and offensive line), Chris Johnson's awful 2011, and Jamaal Charles' knee do turn me away from putting them in my top 10. They might turn out to be good options for 2012, but would I draft them/pay more for them than these guys I have listed? Not right now. Not until I hear happy sounds from Matt Forte & his contract dispute for example. The difference between the top 4 backs is really quite minimal. Despite being the NFL's rushing leader in 2011 MoJo is the clear #4 simply because of the dire nature of the team around him and struggles the Jags had in getting anywhere near the opposition endzone. Rice, Foster and McCoy have more home-run potential and passing involvement, as well as fewer "tough" carries against stacked boxes like MoJo will face. After them you're taking a flier on health and upside. Ryan Mathews has been impressive but injury prone, McFadden could given you 8-10 MVP weeks before getting injured. It's just who you like and who you don't. Calvin Johnson is the undisputed #1 WR for 2012 after a truely special 2011 season. Larry and Andre get some name-value and reliability boost to stay atop the young up and comers. Fitzgerald continues to produce no matter who is throwing balls to him, while 2011 was kind of a lost season for Andre Johnson, with injuries hampering him all year, but that shouldn't put you off a guy who has all the talents to finish as the #1 WR when the season comes to a close. 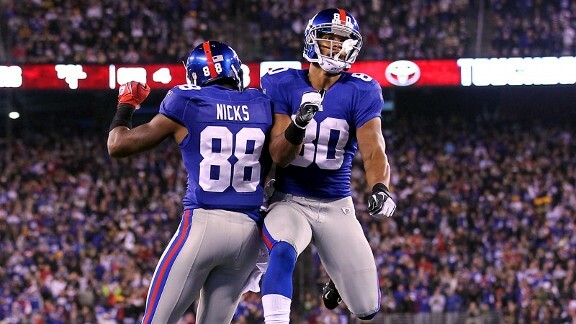 Victor Cruz's break-out season, and his post-season performances, propel him to #4. But be wary that teams may begin to roll coverage to him and leave Hakeem Nicks as a more favourable target for Eli. Welker, despite being unhappy at having to play on the Franchise Tag, should produce yet another 115+ catch, 1,200+yds and 5-8 TD season. In truth though, behind the top 3 are about 20 receivers of very similar potential. AJ Green, Dwayne Bowe, Hakeem Nicks, Marques Colston to name but a few could all out-produce those I've put in at 4-10. 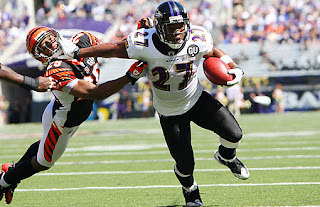 Much like running back, the wide receiver position seems to be one of injury risk and personal preference. Jordy Nelson should still benefit from coverage being focused on Greg Jennings, Roddy White still racks up the targets despite Julio Jones' presence, while the reunion of Jay Cutler and Brandon Marshall could result in Marshall's return to fantasy dominance. Yes, I have Graham over the Gronk. It doesn't make me happy, but it does make sense. Gronkowski scored 46 more points (ESPN standard scoring) than Graham in 2011, so why have I got the Saints man above the Patriot? Targets. Jimmy Graham had 24 more targets than Gronk (I include Gronk's 1 rushing play & TD as a pass since it was a passing play that just happened to go backwards) and caught 9 more balls. The difference came in Gronk's 7 more TD's. Yards and targets are far more likely to repeat than touchdowns are, and when you factor in the presence of Brandon Lloyd and Brady's tendency to spread the ball around, and Meachem's leaving New Orleans, it's likely that the gap in targets will only widen. Gronk's 2011 season was magical, and he will remain a huge miss-match for defenses, particularly in the redzone, but it's very likely that he'll become the focal point for opposing coverages when the Patriots are near the endzone. Behind those two Jermichael Finley is a risk with an awful lot of reward. He's gets to catch passes from the other great QB in the league, but only when healthy. He's yet to start all 16 games in a season, yet to catch more than 55 passes or get over 800 yards receiving. But he's just as much of a match-up nightmare as Gronk and Graham can be. A full season should see Finley get up towards their numbers. Jason Witten continues to be a good, if unspectacular, fantasy option. He can be trusted to play in all 16 games, and get close to if not exceed 1,000 yards receiving. 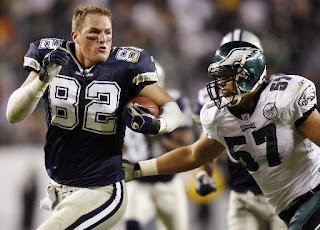 The issue can be his TD's (averaging 5 a year since 2008), but given the age of Tony Gonzalez, and the injury factor of Antonio Gates, Witten continues to be firmly a top 5 TE. Aaron Hernandez is an extremely interesting player this season, and maybe one of the more under the radar guys. Standing in the immense shadow of Rob Gronkowski, Hernandez is still able to put together good numbers. with 79 catches, 910 yards and 7TD's in 2011 Aaron Hernandez was the 3rd best TE in fantasy last season, the issue is that Hernandez can come and go in Patriots gameplans. He had 3 100yd+ games but also 6 games with less than 50yds. If you can put up with some down weeks then Hernandez can reward you with some huge ones. As for Vernon Davis, Jermaine Gresham and Dustin Keller? Well they're all talented, and if given the stellar QB's some of the others have could probably put up great numbers of their own. But as it is they have very questionable triggermen. If their QB's can perform, then they can be extremely good players. I'm not going to rank the defenses. Why? Because they change so often and are so difficult to predict it's almost pointless. Yes, the usual suspects of the Ravens, Bears and Steelers will probably be the first units taken, along with last years stand-out teams San Fran and Houston. But even that they aren't certainties. Takeaways can evaporate very quickly year to year, and ranking positions that shouldn't be taken until the penultimate round is really pretty pointless. Same story with kickers. There's always one idiot that jumps on a kicker early and there's never a need or a reason to. So there you have it. Some very early rankings. I'm not going to offer up overall rankings or anything like that, not yet anyway. If you agree, disagree or want to have a go at me for leaving your favourite player off then leave a comment. Other Fantasy Files will be coming throughout the summer, so keep your eye out for them.